Cruise the East Coast aboard Sea Princess before journeying through the heart of Australia spending time in Darwin & Adelaide. Explore the highlights of each new port of call as the Sea Princess carries you up the East Coast. Escape to the picturesque National Parks of the Top End. Indulge in the all-inclusive service on board The Ghan Expedition. Sample some of South Australia’s finest wines and sumptous food. 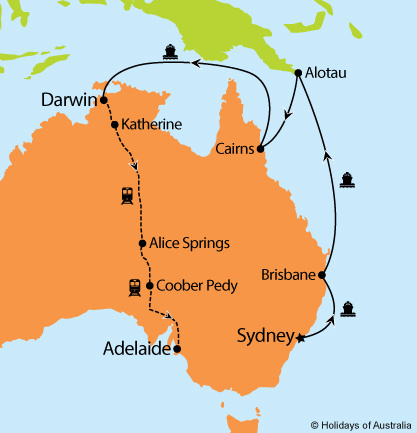 10 nights aboard Sea Princess cruising from Sydney to Darwin with port calls in Brisbane, Alotau (Papua New Guinea) and Cairns.Includes onboard meals and entertainment. Full day Litchfield National Park Waterfalls tour OR Kakadu National Park tour including lunch. 3 nights aboard The Ghan Expedition from Darwin to Adelaide in Gold or Platinum Service. Includes all meals, drinks and off train experiences in Katherine, Alice Springs & Coober Pedy. ^Save $100 per person offer is available on new bookings only and has been applied to the advertised price. $1000 reduced deposit is per person twin share, single deposit is $2000 and do not include the cost of flights, which will be additional if applicable. Valid on bookings made & deposited by 31 March 2019. Travel insurance voucher must be used within 7 days of booking, is valid only when booked with Holidays of Australia & the World and is not redeemable for cash or any further discounts.